David Johnston was President of the University of Waterloo from 1999 to 2010 before serving as the 28th Governor General of Canada until 2017. 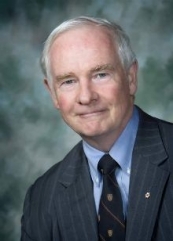 David Johnston completed his university studies with distinction in three countries: the United States (Harvard AB 1963), England (Cambridge LLB 1965) and Canada (Queen’s LLB 1966). While at Harvard he was twice named to the all-American hockey team and is in Harvard’s Athletic Hall of Fame. His academic specializations are securities regulation, corporation law and communications law. Professor Johnston taught law at Queen’s University (1966), and the University of Toronto (1968), and was the University of Western Ontario’s Dean of Law from 1974-79. In 1979 he was named Principal and Vice-Chancellor of McGill University and in July 1994, on stepping down as Principal, returned to McGill’s Faculty of Law as a full-time Professor. Professor Johnston took office as the fifth President of the University of Waterloo on June 1, 1999, and was formally installed as President and Vice-Chancellor later that month. Among the many honours accorded Professor Johnston are honorary doctorates from more than a dozen universities and status as a Companion of the Order of Canada. He is the author/co-author of 20 books including updated editions. He was President of the Association of Universities and Colleges of Canada, the Conférence des Recteurs et des Principaux des Universités du Québec, the founding Chair of the National Roundtable on Environment and the Economy and the only non-US citizen to chair Harvard University’s Board. For the federal government, he has chaired the Information Highway Advisory Council, the Blue Ribbon Panel on Smart Communities, the Advisory Council on On-line Learning, the Committee on Canadian Information Systems for the Environment, and the National Broadband Task Force. He has also chaired the Canadian Institute for Advanced Research and The Neuroscience National Centre of Excellence. Professor Johnston served on many other provincial and federal task forces and committees and has been on the boards of a number of companies including CGI Group, Masco Corp, Fairfax Financial Holdings, ARISE Technologies Inc., and was a founding trustee of the MasterCard Foundation. James Downey was President of the University of Waterloo from 1993 to 1999. A graduate of Memorial University of Newfoundland, he attended the University of London as a Rothermere Fellow and earned a PhD in English literature. At Carleton University, where he began his career, he held a series of academic and administrative posts including Vice-President Academic and President pro tempore . From 1980-90 he was President of the University of New Brunswick. During that period he also served terms as President of the Canadian Bureau for International Education, Chair of the Association of Atlantic Universities, and Chair of the Corporate-Higher Education Forum. From 1990-93 he was Special Advisor to the Premier of New Brunswick; Special Advisor to the Association of Universities and Colleges of Canada; and co-chair of the New Brunswick Commission on Excellence in Education, which published two reports that guided educational reform in that province. During his presidency of the University of Waterloo, he also served terms as Chair of the Council of Ontario Universities and Chair of the Association of Commonwealth Universities. His publications include The Eighteenth Century Pulpit (Oxford University Press, 1969), Fearful Joy (McGill-Queen1s University Press, 1973), Schools For A New Century and To Live and Learn (reports of the New Brunswick Commission on Excellence in Education, 1992, 1993), and Innovation: Essays by Leading Canadian Researchers, edited with Lois Claxton (Key Porter Books, 2002). After stepping down as president, he founded and directed at Waterloo Canada’s first centre for the study of co-operative education; led an annual seminar for new university presidents sponsored by the Association of Universities and Colleges of Canada; and from 2007 to 2010 was founding president of the Higher Education Quality Council of Ontario. Among his awards are nine honorary degrees; the Symons Medal for outstanding service to higher education in the Commonwealth: and the David C. Smith Award for contributions to universities and public policy in Canada. He is an Officer of the Order of Canada. Douglas Wright was President and Vice-Chancellor of the University of Waterloo from July 1981 to April 1993. He is a Fellow of the Canadian Academy of Engineering, an Officer of the Order of Canada, and in 1993 was appointed Chevalier dans L'Ordre National du Mérite de France. Burton (Burt) Matthews was President and Vice-Chancellor of the University of Waterloo from July 1970 to June 1981. He was appointed President Emeritus in 1991. Born in Ontario, he earned a bachelor's degree from the University of Toronto through the Ontario Agricultural College (OAC), a master's degree from the University of Missouri, and a PhD from Cornell. He began his academic career at OAC and continued with the University of Guelph at its founding in 1964. He held various administrative posts prior to his appointment as the first Vice-President Academic of the University of Guelph. In 1970 he was appointed President and Vice-Chancellor of the University of Waterloo and was reappointed for a second six-year term in 1975. After stepping down as President, he was appointed Chair of the Ontario Council on University Affairs by the Premier of the Province. In 1983 he was appointed President and Vice-Chancellor of the University of Guelph and retired from that position in 1988. He is serving or has served as Director of a number of corporations including Mutual Life of Canada, Mutual Trust, Campbell Soup Company Ltd., John Wiley and Sons (Canada). In 1987 he was appointed to the Board of Trustees of the International Center for the Improvement of Maize and Wheat (CIMMYT) and became its Chair in 1990. Among his awards are honorary degrees from the Universities of Sherbrooke, Waterloo, and a Fellowship of the University of Guelph. Dr. Matthews died on January 2, 2004. Dr. Joseph Gerald (Gerry) Hagey was undoubtedly the key person among the small group of Kitchener-Waterloo citizens who initiated the founding of the University of Waterloo. Without him, none of it would have happened. He has been therefore, profoundly influential in the lives of everyone connected with the University, Alumni, students, faculty and the non-teaching support staff. Dr. Hagey was born in Hamilton, Ontario in September 1904. He was educated in Hamilton and later at Waterloo College, then a church college affiliated with the University of Western Ontario, from which he was graduated in 1928 with a bachelor of arts degree. Subsequently, he joined the sales staff of a Kitchener rubber company, B.F. Goodrich and later, after stints in the printing field in Toronto and Kitchener, he became advertising and public relations manager for that company. Throughout his career in industry he maintained an active interest in the affairs of Waterloo College and in 1953 he left B.F. Goodrich to accept the position of president of the College. This was a period of rapid industrial and population growth for Canada and Dr. Hagey soon began to envisage an expanded educational institution within the Kitchener-Waterloo community. He felt that Canadian society needed more people with scientific and technological educations. Engineering schools were reputedly notoriously difficult to launch, however, and Dr. Hagey became intrigued with the idea of the co-operative system of education. The idea was not without its detractors, and the task of gathering sufficient support so that it could be undertaken was a formidable one. Nonetheless Dr. Hagey was successful and in the summer of 1957 the first classes got underway, organized by what was at that time called the "Waterloo College Associate Faculties." The idea was successful from the outset and before long the University of Waterloo came into being. Since then the university has become Ontario's third largest and a major Canadian educational institution. Dr. Hagey resigned his position with Waterloo College in 1959 and that institution subsequently evolved as Wilfrid Laurier University. The success of the University of Waterloo is in no small measure a tribute to Dr. Hagey's vision, his leadership during the early, difficult years, and his administrative capabilities. In 1958 Dr. Hagey was awarded an honorary LL.D. Degree by Susquehanna University, Pennsylvania, in recognition of his contributions to higher education in the Kitchener-Waterloo area. He was later similarly honoured by Concordia University, the University of Western Ontario, Wilfrid Laurier University and the University of Waterloo. Illness led to his early retirement in 1968; however, he continued a vigorous life for many years after retirement. In 1969 he was named citizen of the year for the Twin Cities by the K-W (Kitchner-Waterloo) Jaycees Club. In 1970 he participated in a special mission to Sudbury in an effort to resolve a variety of problems on the Laurentian University campus; the trip was made at the request of the Provincial Ministry of University Affairs. Dr. Hagey continued an active interest in photography. He volunteered his time to photograph over 1000 collection management "photographs of record" for the Museum and Archive of Games. He also did many detailed layouts of the exhibits in the Public Gallery of the museum. Since public exhibits change every 90-100 days and are never repeated, Dr. Hagey's photos of the exhibits are now archival records. Dr. Hagey died on October 26, 1988.